Using extension methods in Visual Studio can really help to reduce writing boilerplate code. Here’s a simple snippet which can be used to create extension methods. After importing the snippet via Tools > Code Snippets Manager you can use it by typing exm[TAB]. 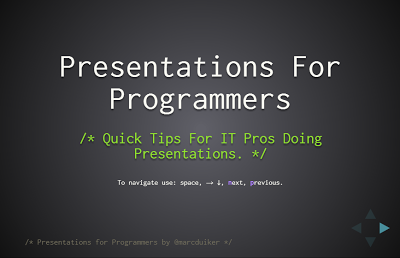 In the last few years I find myself doing more and more (technical) presentations. I have to admit I even start to like it. 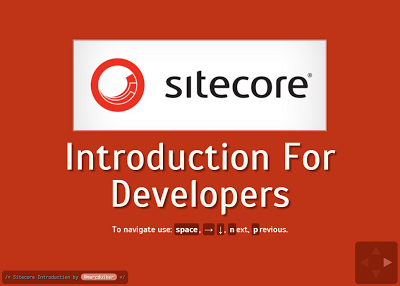 I absolutely admire great speakers like Scott Hanselman (Microsoft) and Tim Ward (Sitecore/CluedIn). They speak with such passion about technology that I immediately want to use or do whatever they promote. Although my presentation skills are nowhere near the level of these speakers I do have a good grasp of what makes a great presentation. So before becoming a great speaker lets start with creating great slides. I’m currently following an online TDD course by Roy Osherove. I’m about half way through and although I have quite a bit of experience writing unit tests and using test frameworks I’ve gained a lot of knowledge from the course already. Here are some highlights about good unit tests and test reviews. If any of these are not taken into account during development developers are likely to drop unit tests all together because it will become a burden to use instead of an aid.